Madison College volleyball player Andrea Bauer (2) sets the ball for a teammate during a recent match at Redsten Gymnasium. As the end of the volleyball season draws near, the top of NJCAA Division 3 rankings and the N4C conference standings paint the same picture. Harper College is at the top followed by No. 2 Madison College. It sets the stage for an intriguing re-match between the two teams to close out the conference season on Oct. 20. Harper College stands at 10-0 in conference play, 29-1 overall. Madison College is 9-1 in conference play and 24-2 overall. A win over Harper College would likely give Madison College a share of the conference crown, as long as the WolfPack handles Triton College on Oct. 18. In addition, a victory in the game at Harper College could influence playoff seeding. Still, that won’t have much impact on where the WolfPack plays in the tournament. The higher seed will host the quarterfinal game on Oct. 26. After that, the remainder of the NJCAA Division III Region IV tournament will be played at Madison College on Oct. 29. That means if there’s a third match between the two teams, it will be at home for the WolfPack. When the two teams played on Sept. 22, visiting Harper College won a close five-set match. Since then, Madison College has won five straight matches and hopes to continue that momentum through its three remaining regular season matches. Andrea Bauer, TeAnn Harms and Keifer Zimmerman have led the WolfPack attack throughout the season. Bauer leads the team with 263 kills and 38 aces. Harms is second in kills with 258 and has 23 blocks and 19 block assists. Zimmerman has 195 kills and 32 aces. Setter Taylor Genthe leads the team in assists with 644 on the season. Kaitlin Mooney has the most digs on the team with 459, followed by Bauer with 401. Madison College put on a dominant performance on Oct. 13 at Milwaukee Area Technical College, winning 25-11, 25-14, and 25-13. Bauer led the team with seven kills, while Samantha Jacobsen had 14 assists. 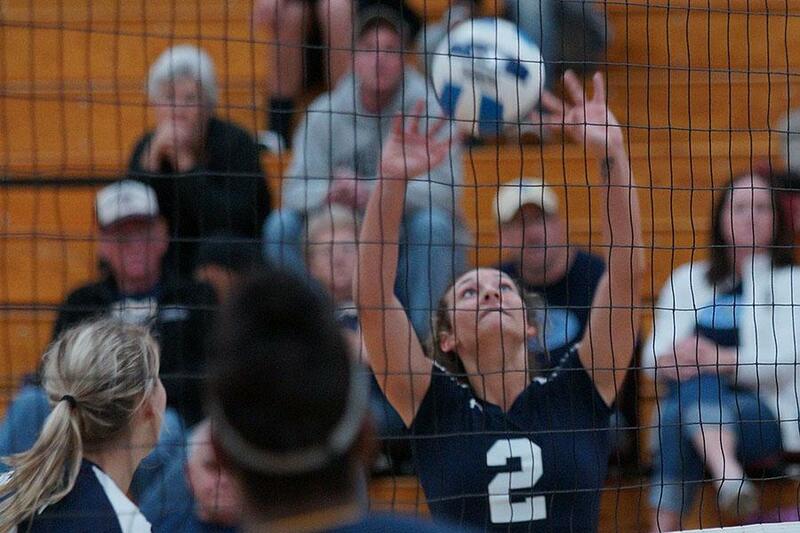 A season-high 18 aces helped Madison College easily defeat Joliet Junior College on Oct. 11, 25-15, 25-12, and 25-12. Mooney led the team with five aces, while Bauer and Genthe each had four. Zimmerman led the team with eight kills and 12 digs. Despite dropping a game early in the match, Madison College posted a 3-1 victory on Oct. 6 over Carthage College’s JV team. Harms led the team with 17 kills, while Megan Corcoran added 12. Zimmerman had 28 digs, while Mooney added 23.